Nobody wants to be that guy. You know the one. If you missed his car’s model name splashed across the front of his t-shirt, don’t worry – he’d tell you about it anyway. 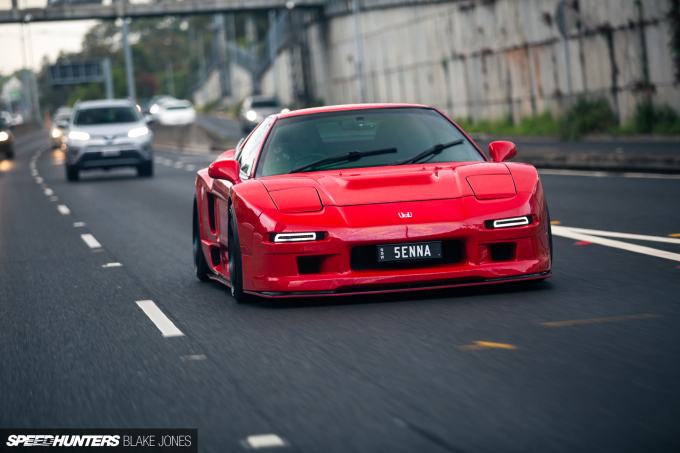 Because his car is the best. It’s the fastest. The most interesting. The rarest. And thus, by implication, yours is… less. I often worry that I’m becoming that guy. 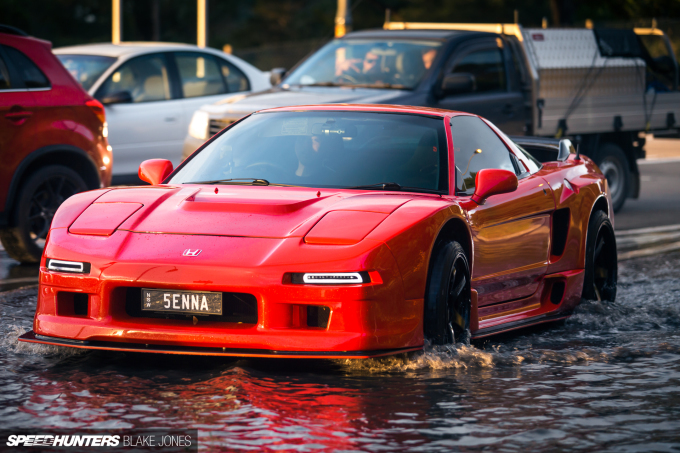 I bought an NSX a little while ago and have spent much of my spare time since poring over articles and diagrams learning about the thousand little details that went into making it such a unique, usable and fun sports car. Sometimes I want to talk about those little details a little too much. 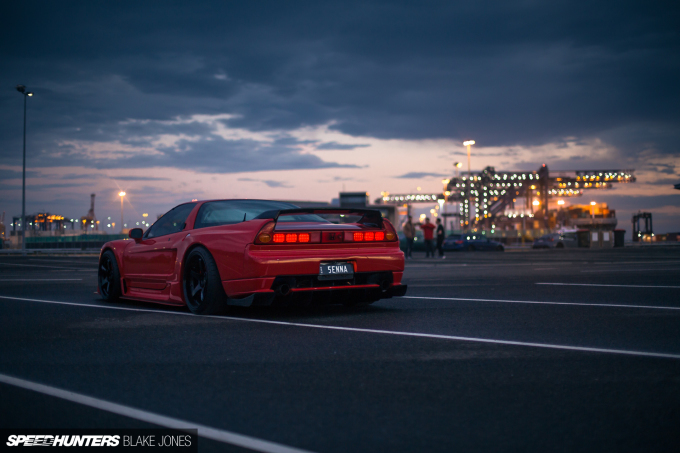 Hanging around the track-built cars coming out of the Advance workshop was a great source of inspiration, but also solidified a thought in my mind: There is only one right way to modify an NSX, and to deviate from that specific path is wrong. 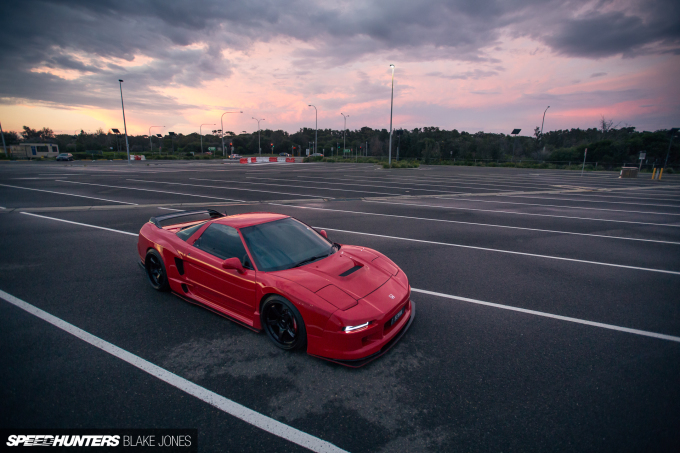 But I stumbled upon a red NSX at last year’s World Time Attack Challenge in Sydney, Australia and quickly realised it was my perception which was wrong. Roland, the owner of 5ENNA, is definitely not that guy. He’s actually one of the most friendly, open people I’ve ever met, and his love for cars stretches far beyond just one make or model. 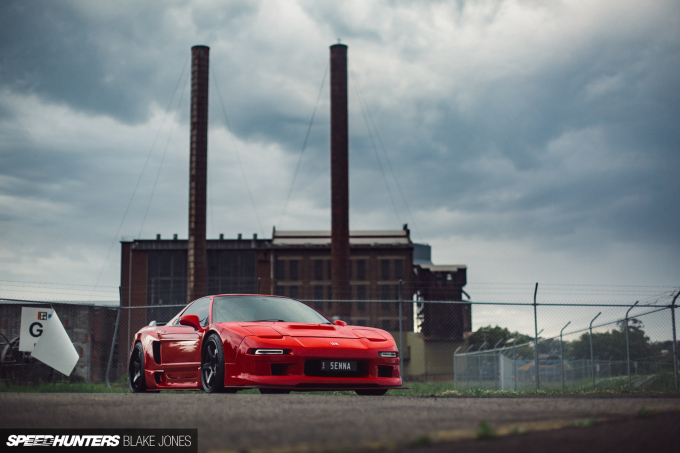 His garage holds the kind of European machinery that the rest of us make do with driving in Need for Speed. 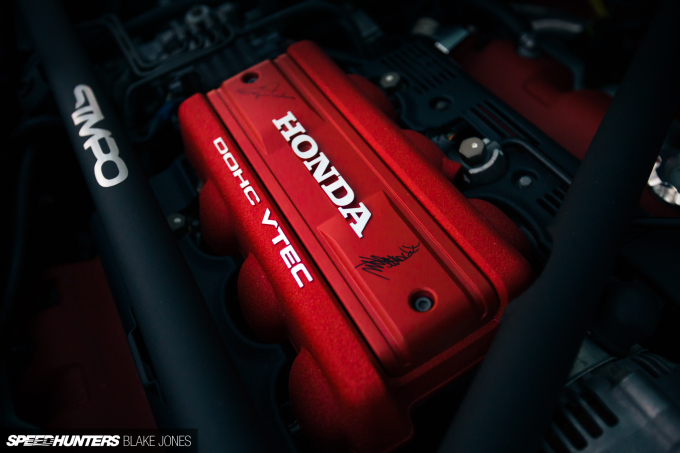 So what is an old Honda to a man who has it all? 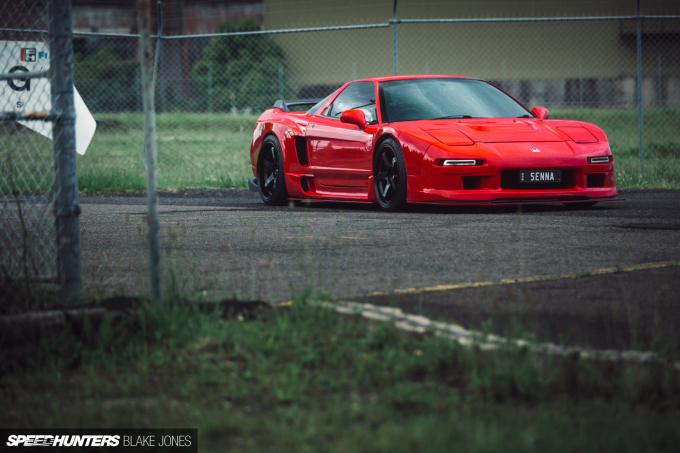 It’s certainly not the fastest, nor most luxurious, nor most valuable car for Roland. 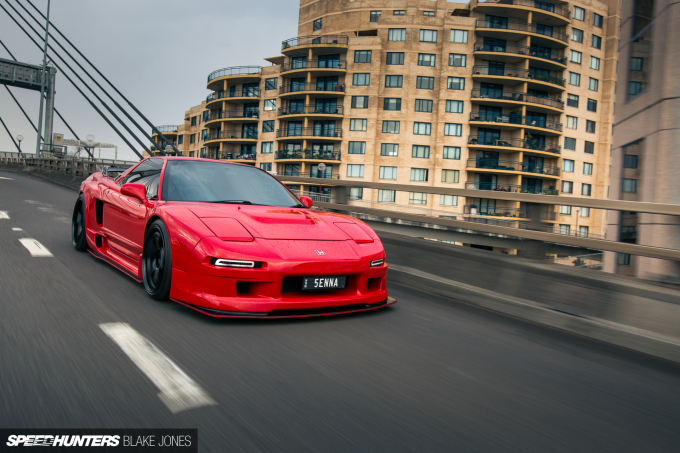 It’s the fact that it’s 100% his, a creation that melds a passion for Japanese performance, a bit of show car flair, and even high-end audio into a legitimately usable package. It has all come together so completely, with so much finesse that you’d forgive a member of the general public for assuming it came from some Italian supercar factory in this form. I first shared the car on our Speedhunters Instagram as part of the ‘Spotlight Battle’ during WTAC, but after it won so convincingly I knew that a simple spotlight wouldn’t suffice. 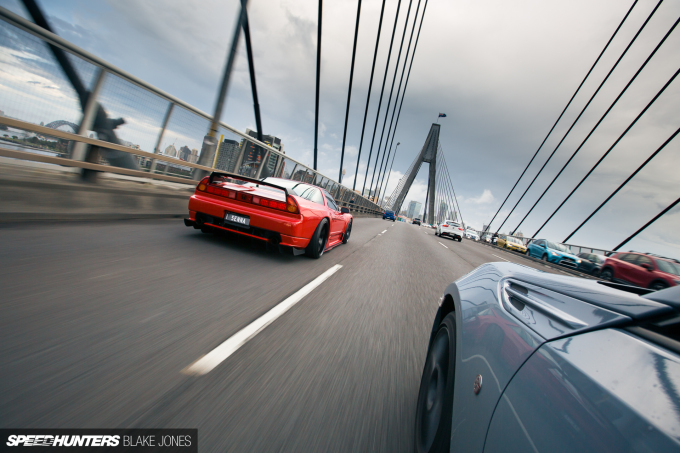 So, Roland and I agreed to meet up a few days later and hit a few of my favourite photo locations from when I was living in Sydney – places where I’d often take friends’ cars while I was learning how to shoot. Roland and I had barely met prior to this, but before long it was just like old times – a couple of car guys hanging out, talking about nothing in particular. The perfect way to spend an afternoon in Sydney, really. Let me go back to being that guy for a moment. 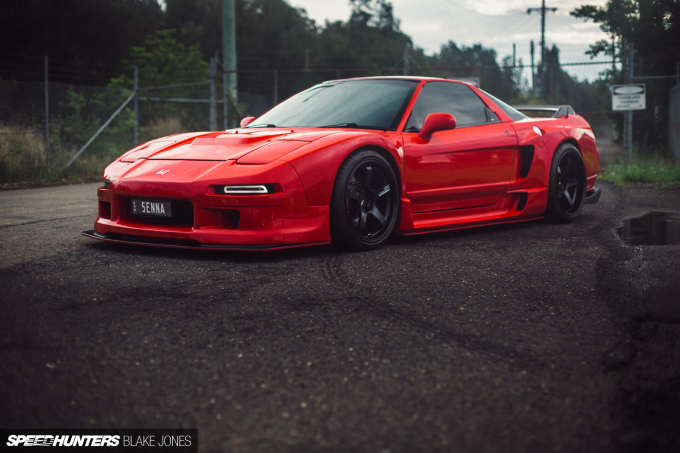 Messing with the factory lines of an NSX is risky business; the original design has aged exceptionally well and remains one of the most iconic sports car designs to come from Japan. 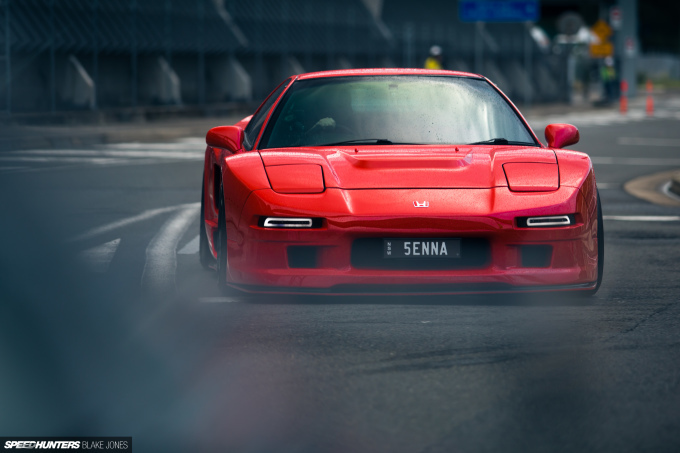 Roland’s vision went beyond the lithe wedge that debuted at the 1989 Chicago Auto Show. 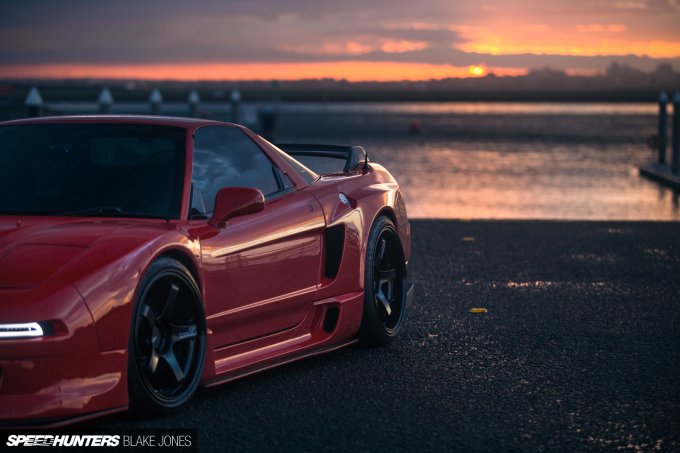 The NSX needed to be more aggressive in every way and draw inspiration from motorsport and the Japanese tuning culture that elevated the model beyond even Honda’s original goals. 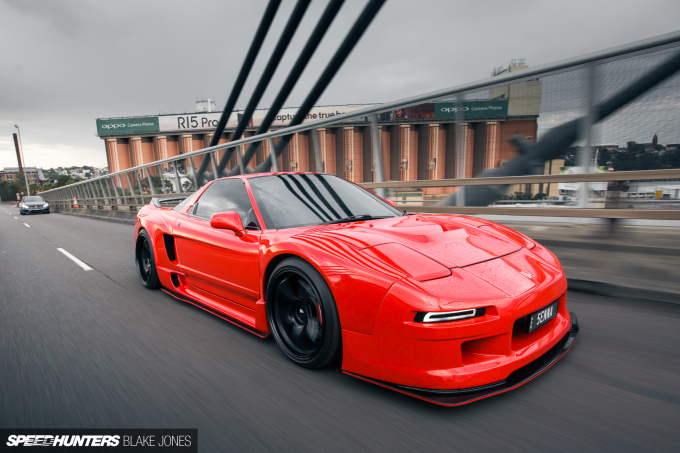 There’s a few off-the-shelf wide-body kits available for the NSX, but most of them are appropriate for either track cars or show cars, and not much in between. That meant going custom. Roland enlisted Peter of Sydney’s Bodyform Motorsports to apply some serious creative thinking and craftsmanship in coming up with a solution. The end result is based on a few key parts from the aftermarket, but with a ton of custom work to create something consistent and handsome. 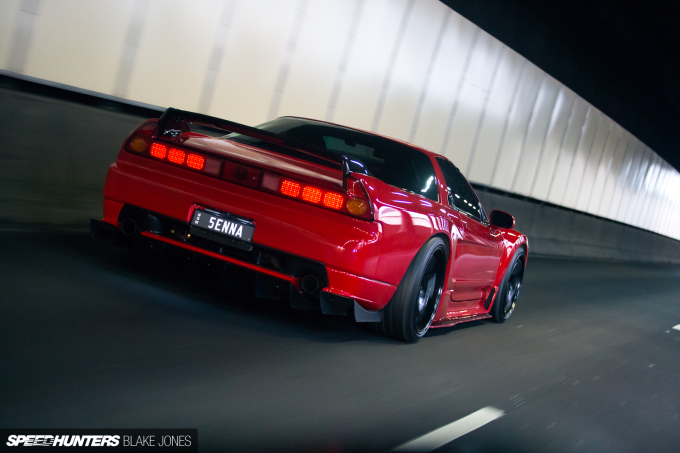 The rear fenders were Sorcery items, but where the Sorcery piece extends directly to the rear and leaves a rear-facing opening behind each tyre, Peter tapered the rear edge back in to meet the original JDM rear bumper. 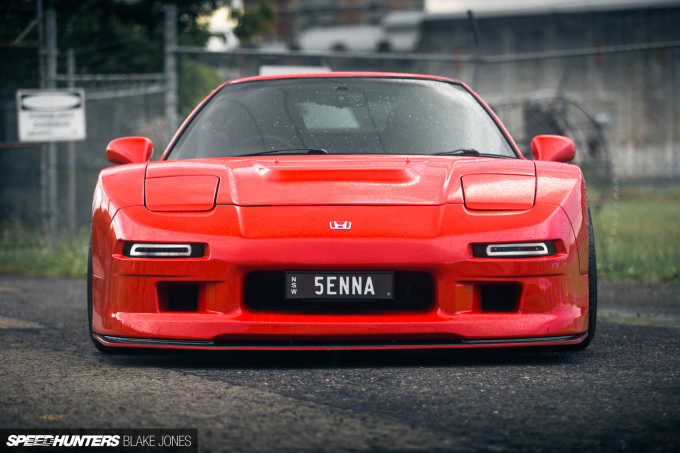 The Marga Hills side skirts were reshaped to meet the Sorcery front fenders, and a custom splitter extension was added. 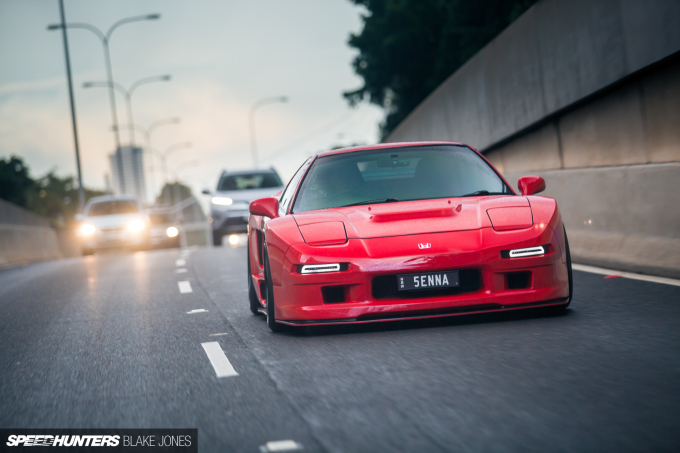 The front bumper was once a Marga Hills piece too, but it’s been so significantly redesigned at this point that it’s better to just refer to it as a one-off Bodyform piece. The relationship between Roland and Peter was less client/tradesman than collaborative team, with Roland sketching out his ideas on paper and then spending time with their heads together to make it work in the real world. 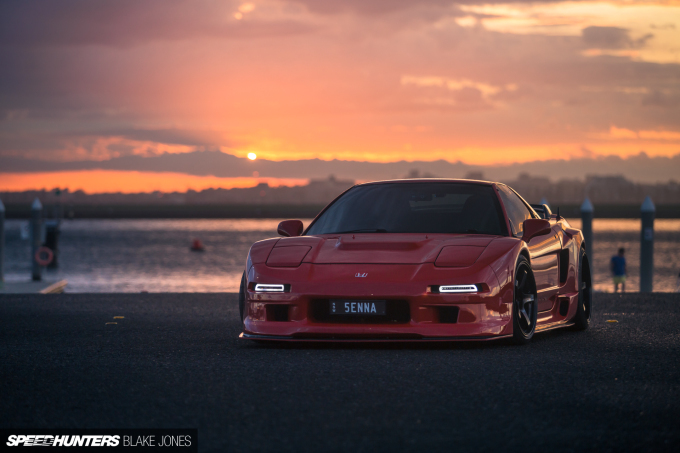 It’s also refreshing to see the early NSX’s pop-up headlights retained. 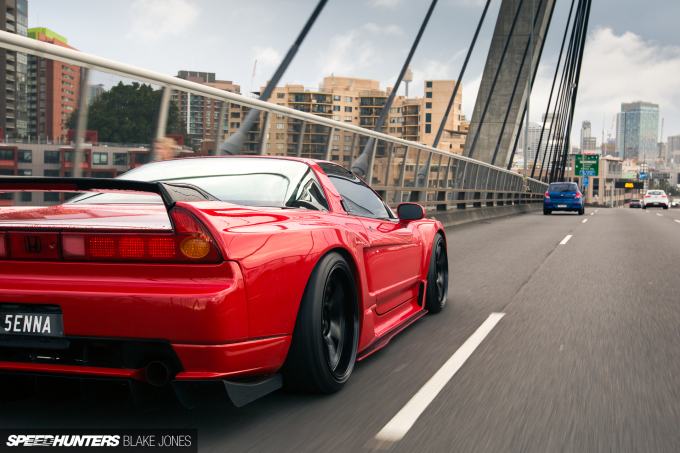 Typically when this much bodywork is being done, owners will ‘upgrade’ to the later fixed units, but every time that happens a VTEC fairy drops dead. 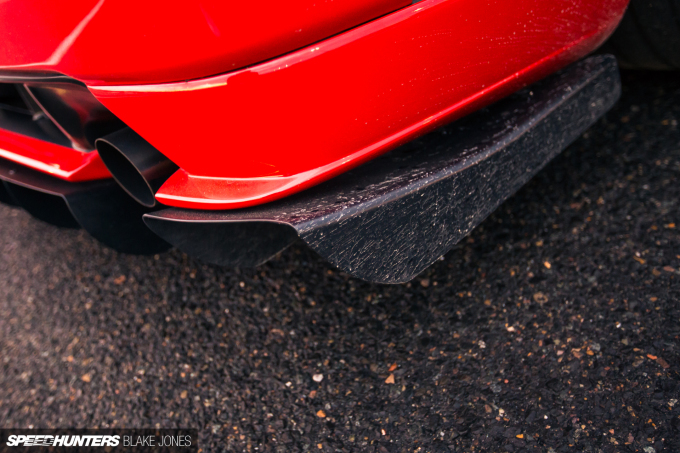 The rear diffuser from Difflow looks the part and helps clean up rear airflow, but Roland had these custom apron pieces made to extend the diffuser outwards while visually complementing the centre section. 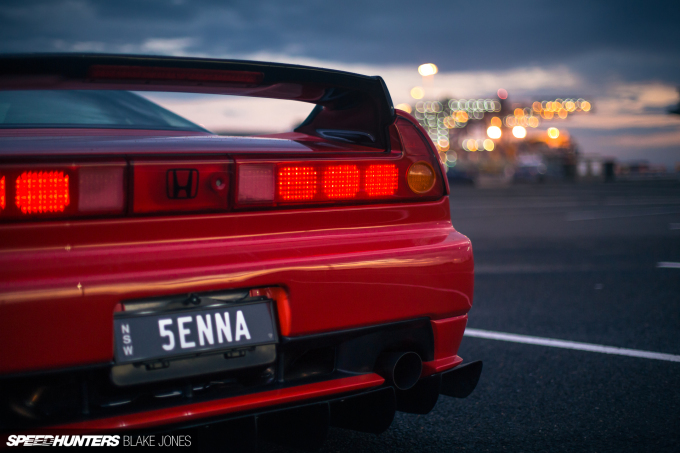 A clean and purposeful rear end is finished off with a Seibon NSX-R-style carbon rear wing and stubby antenna. Roland also has an imposing Sorcery GT wing that completely changes the look of the car into an angry, antisocial street racer, but that’s for special occasions only. 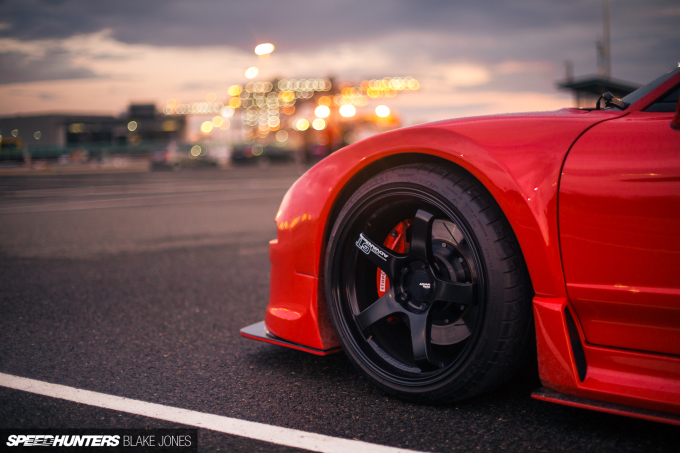 Small details are everywhere and add up to that feeling of completeness when you stand back and admire the car. 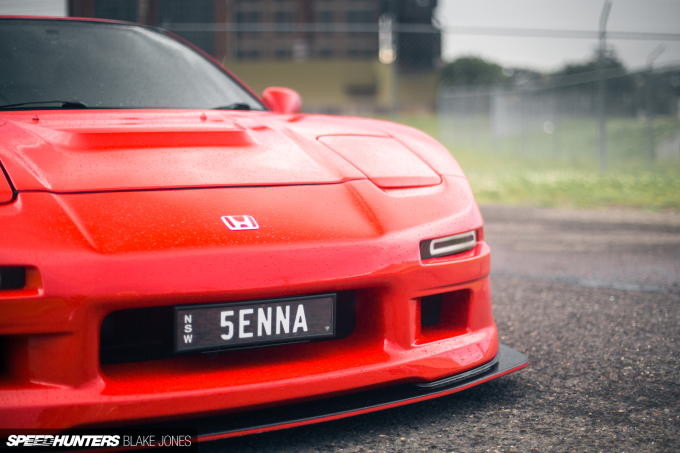 Check out the custom LED driving lights and red pinstripe along the edge of the custom splitter. 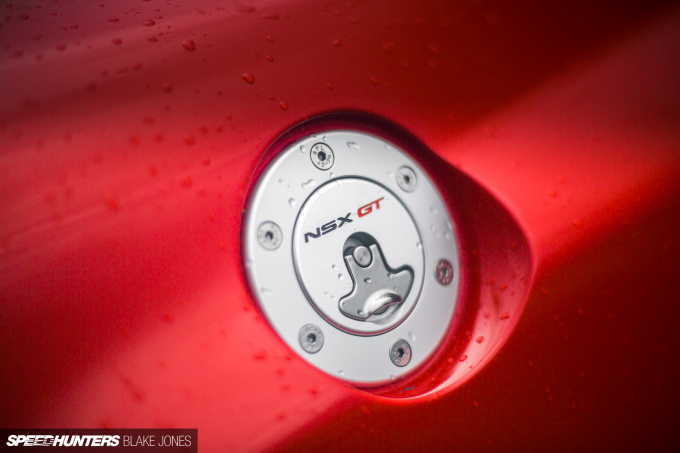 Details like the fuel cap – we’ve all seen these butchered on other wide-body kits – where Peter has cleanly integrated this Newton aircraft-style cap along with a nice little custom touch in the machined NSX GT logo, done as a surprise for Roland. The rear lights have been modernised somewhat with a custom LED setup, finishing off the rear end. The amount of hours Peter spent on this car became basically uncountable as the project morphed into a passion pursuit for Roland and himself, and I think the finished piece is testament to this. 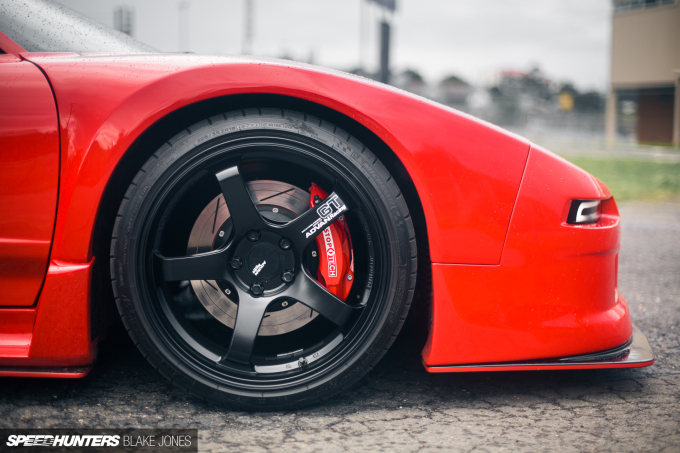 Even the most inspired bodywork needs the right wheels to finish the package, and here double-staggered Advan GT’s (18-inch front, 19-inch rear) fit the bill. 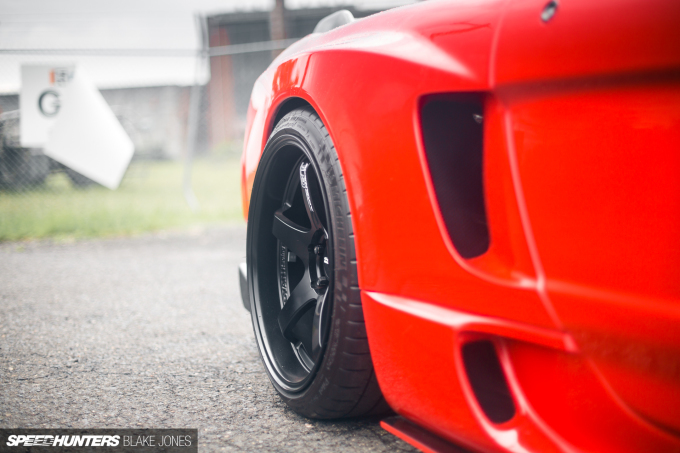 Wedges and five-spokes go together like summer and thongs [He means sandals, folks – PMcG] – it channels a bit of Ferrari F40LM if you ask me, and that’s never a bad thing. 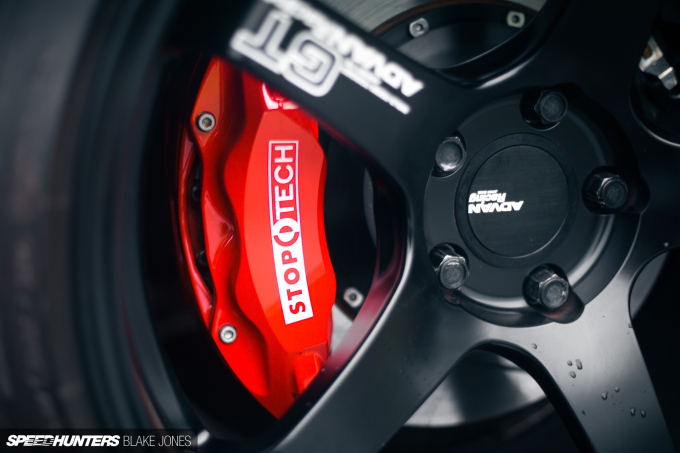 The big brake kit from StopTech is a popular choice for NSX owners looking to beef up the factory car’s units that are rather quickly overwhelmed by more power and a modern, high-grip tyre. It’s pretty hard to debate with the end result – everything else on the road simply fades away into a grey background when 5ENNA rolls through. 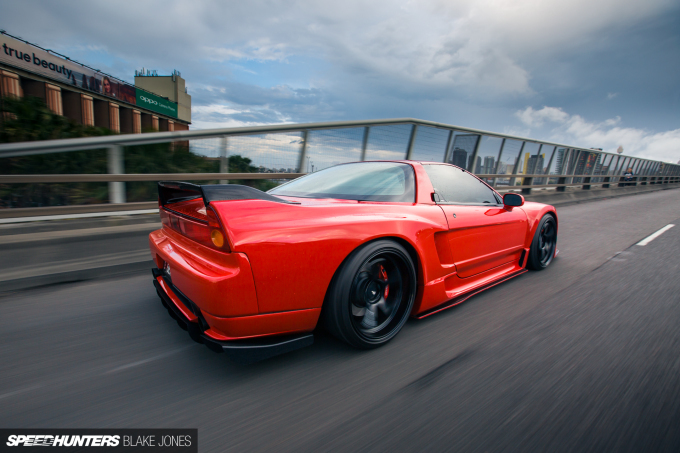 The NSX’s interior is almost impossible to improve upon, and thankfully Roland agrees. Only a few key touch points have been enhanced, like the NSX-R style Momo Tuner steering wheel and hybrid NA1/NA2 NSX-R shifter setup (which is coincidentally identical to that in Project NSX). From the driver’s seat, Roland enjoys a rather unique blend of tactile, old school driving experience and an uncompromising modern day audio setup. 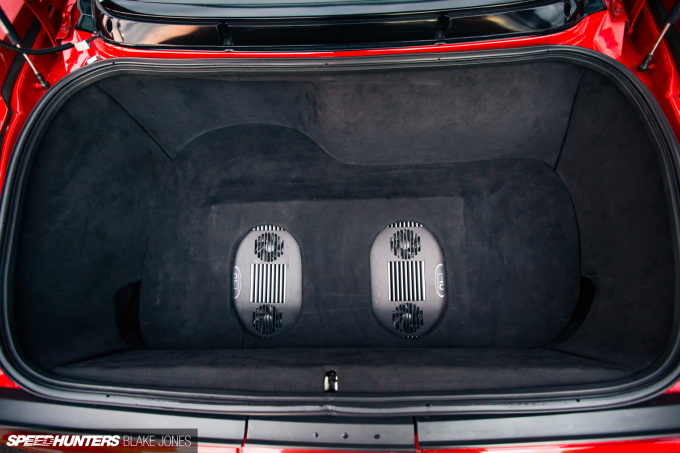 An Alcantara re-trim of the rear trunk had me feeling self conscious about the state of Project NSX’s trunk, and here Roland has integrated two American-made TRU Technology amplifiers that would be more commonly found in high-end audio competition cars. These drive Dynaudio speakers and tweeters as well as the 12-inch Dynaudio sub in the passenger footwell. 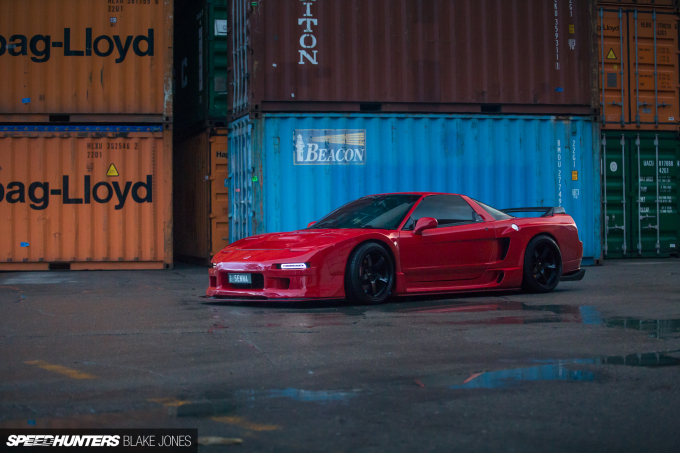 The latter might seem like a strange location, but is actually where the stock woofer sits in the NSX. 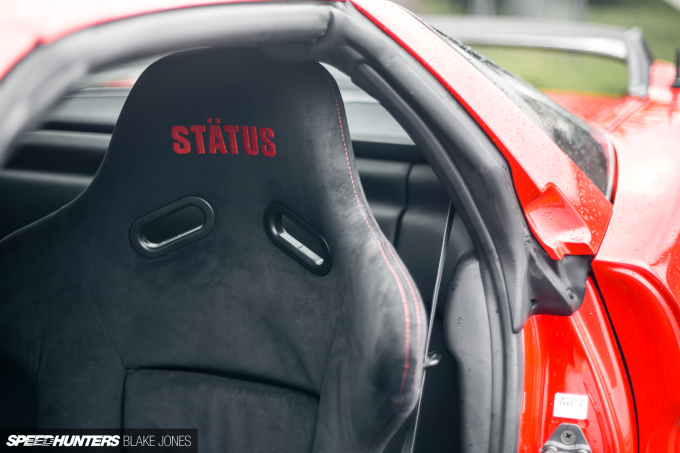 The driver’s seat itself is a suede carbon GT bucket from Stätus finished with matching red details – the passenger gets one, too. 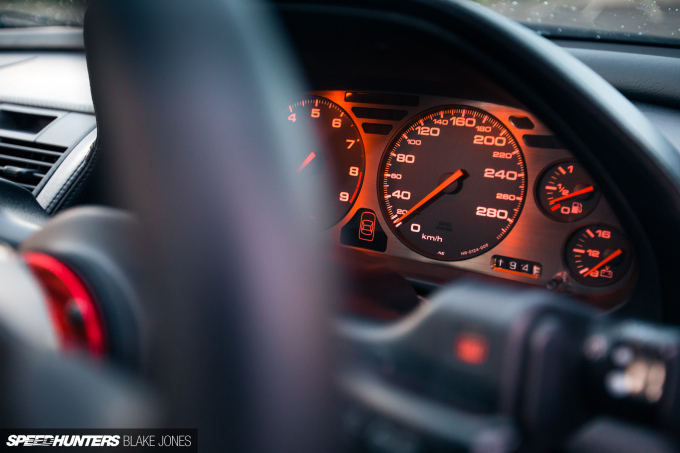 Being Australian-delivered, the car features a rare 280km/h speedo from factory – much more appropriate than the 180km/h meter on the speed-limited JDM cars. 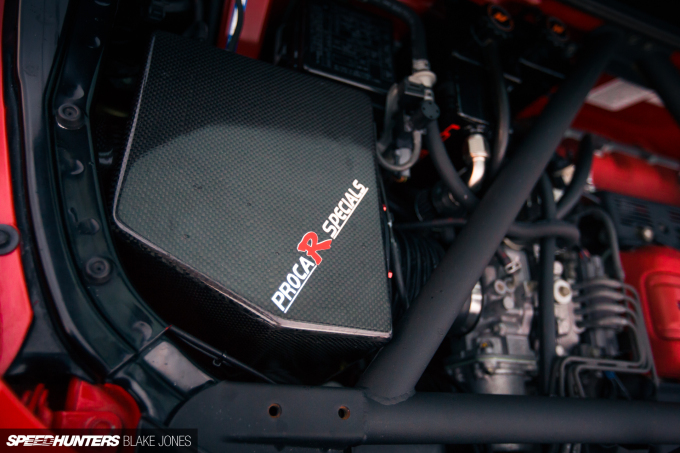 280km/h is ‘do not collect $200, go straight to jail’ territory in Australia, but it must be extremely tempting to wring out the C32B with the few choice modifications Roland has made underneath the NSX-R-style mesh engine cover. The 3.2-litre V6 aspirates through a very nice carbon fibre replacement airbox from one of my favourite NSX suppliers, Geman-based Procar Specials. 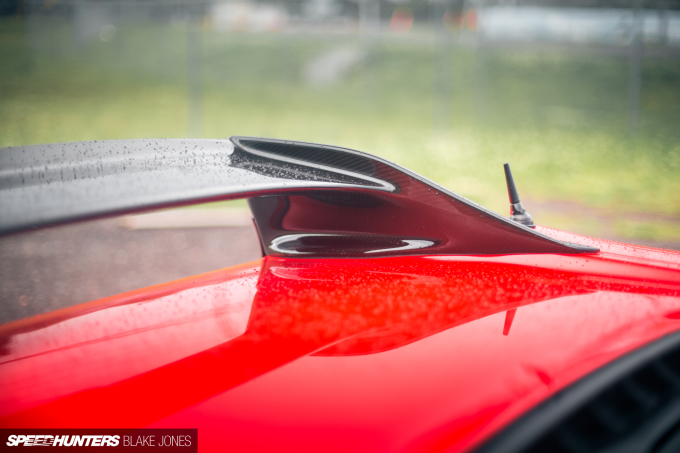 The air is fed through a fender-mounted scoop from specialist supplier Downforce. The engine internals are stock, but as you can see here the cam cover has been blessed by Chief Engineer Uehara san and Motoharu Kurosawa, AKA Gan-san, who completed an epic sub 8-minute Nürburgring lap in an NSX-R.
LoveFab supplied the coolant tank and oil catch can which are mounted neatly along the front firewall. 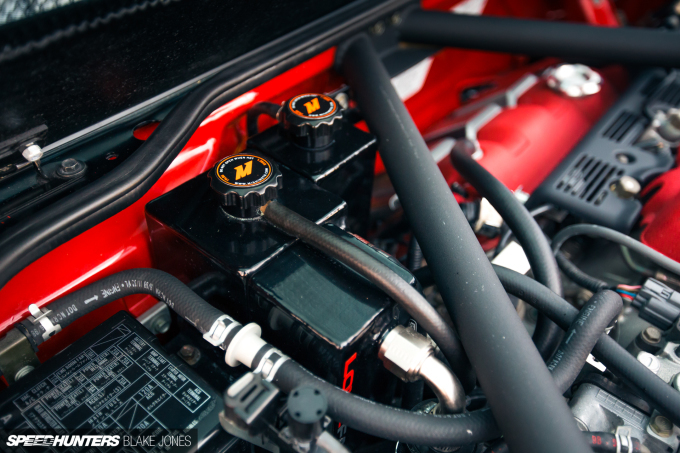 Above is a STMPO strut bar, which triangulates across the top of the engine bay in a similar manner to what can be found in a stock targa-top NSX. 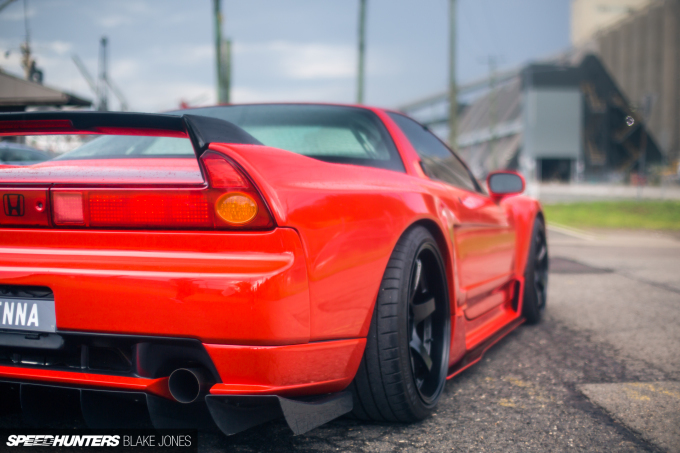 Every NSX owner knows that an upgraded exhaust system is a must to get an appropriately exciting tone from the V6, and Roland chose headers from JDM-favourite Taitec and a GT-One Ver.6 muffler. Roland’s a mature kind of bloke, and prefers not to attract too much attention, but thankfully did oblige me with a little high-RPM C32B music as I chased from my GT86 camera car. 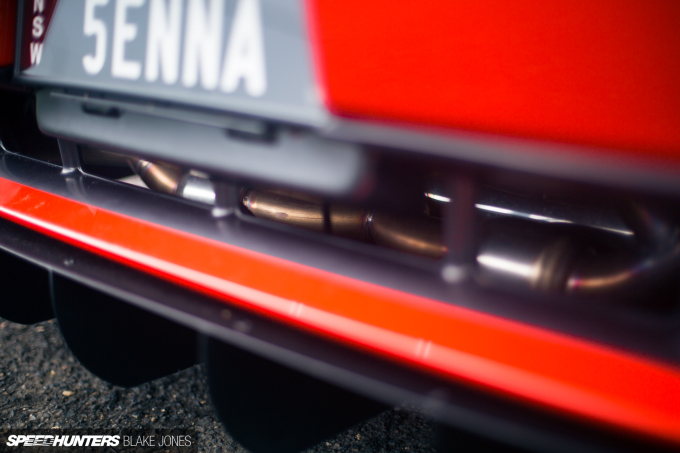 The GT-One muffler uses a complex mix of crossovers, mufflers and sub-silencers to produce a throaty roar down low and a spine-tingling wail up high. We were lucky; as we pulled into our last shoot spot (one of my nearby favourites was being closed right as we arrived), Sydney put on one of its famous springtime sunsets to bid farewell to a pretty horrendous morning of heavy rain. At this stage, another of Roland’s mates had joined us to enjoy the view and shoot the breeze. 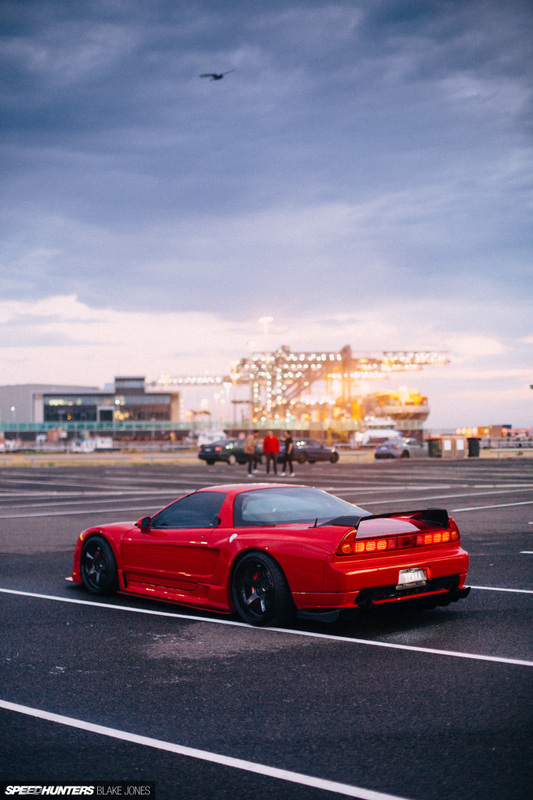 It was the perfect time of day to take in the form of the NSX; the low contrast sunset light has a way of highlighting every contour of a car’s bodywork. Roland mentioned a few small tweaks still to be made, but overall the car is finished and ready to be enjoyed. 5ENNA has quite a reputation in Sydney and even abroad now thanks to an artful film doing big numbers on YouTube, but Roland is all smiles and humility. I’m quietly hoping Roland and Peter have another build planned, because they absolutely knocked the ball out of the park with this one.